Flooding in Sindh and Balochistan has left those affected without shelter, food, or clean drinking water. As the remote location and dangerous weather conditions have hampered rescue missions, the number of casualties is expected to rise. Five million people have been affected by floods in the Pakistani provinces of Baluchistan and Sindh, according to regional officials. At least 133 people have been killed, officials said, and the number is expected to rise. 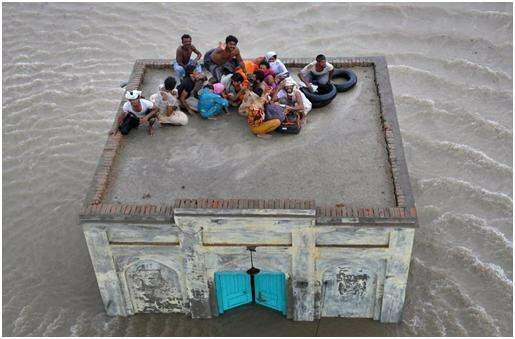 About 900 villages have been submerged and about 100,000 homes have been completely destroyed. "People are moving whatever little they can because of the rising waters," Al Jazeera's Kamal Hyder, reporting from Badin, one of the worst-hit districts in Sindh province, said on Friday [Septmber 9 2011]. "The water has been rising in the last few weeks because of heavy rain. He said residents in the area were in desperate need of assistance, asking for food, drinking water and shelter. "Because most cities have been submerged, there's no clean drinking water. People want tents, because most of the improvised shelters that they have built along the roads are inadequate and the weather department is warning of more floods." Sindh province is a remote area, and relief efforts were hampered by bad weather, making airborne rescue missions impossible. "This is indeed an emergency situation which is going to be a big challenge for the government," our correspondent said. "Roads are cut off ... We're told hundreds of thousands of people are cut off, waiting for assistance. There's no way they can get out unless someone comes to get them". Last year, about 20 million people were directly affected by the worst floods in the country's history. About 2,000 people were killed in the disaster. One year after the floods, more than 800,000 families remained without permanent shelter and more than a million people remained in need of food assistance, according to Oxfam, an international aid organisation.